First off thank you to all your comments regarding my first gel nails post- some very interesting points have been raised. 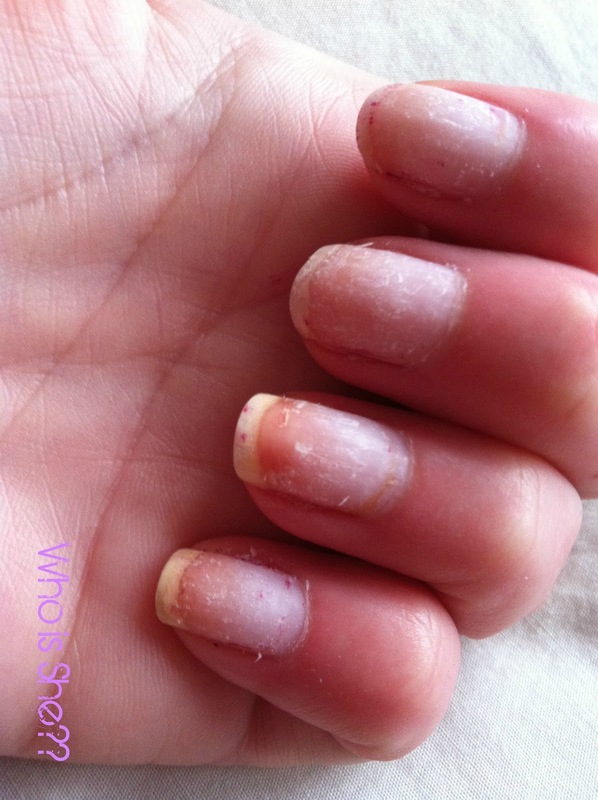 So as promised today’s post is focusing on the removal of gel nails- now I need to dig out the picture I took of Holly’s French manicure gel nails which she had on for her wedding, as all credit of how to remove the nails goes entirely to her. 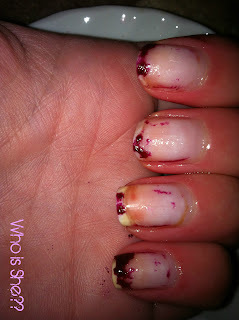 If you haven’t read my previous post, I’ll remind you of the state of my nails just before they were removed. As you can see in the first picture, my left hand only has some major regrowth and one or two slight chips on my index finger. 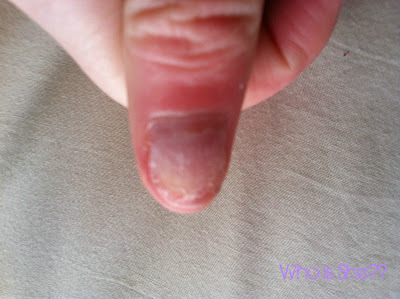 However the second and third pictures show the extent of chipping and peeling on my right hand- not very nice at all. However considering the length of time they have lasted (9th December- 4th January) I am completely sold on the concept of them. I haven’t missed painting my nails at all. 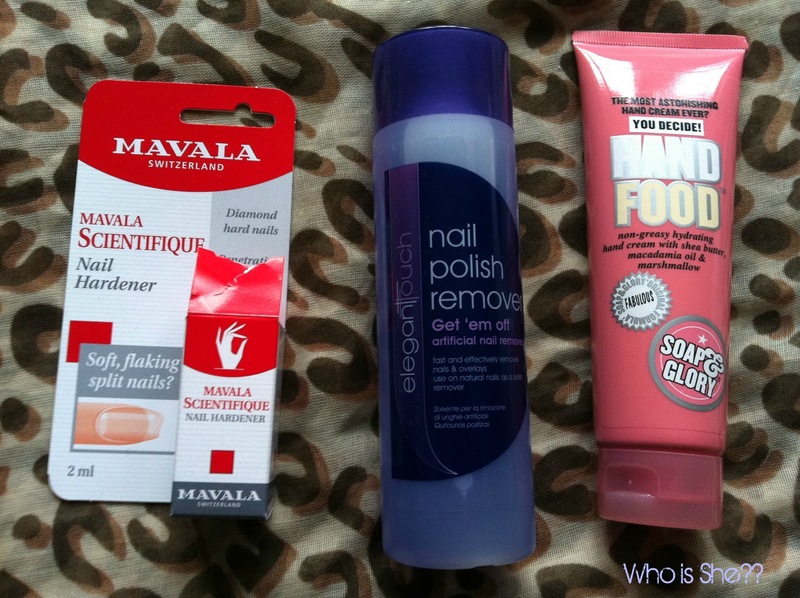 These are the products which I used/are using for the removal and up keep of my nails. Mavada Scientifique, Soap and Glory Handfood, Elegant Touch Get Em’ Off (all from Boots). Now I was under the impression that the Mavada Scientifique would be a clear nail polish. Nope- its blue, smells horrible (like roast dinners) and is more of a liquid which is absorbed into the nail. Don’t let that whinging put you off there as I’m going to be doing a separate review on this, as this is a miracle in a teeny bottle. 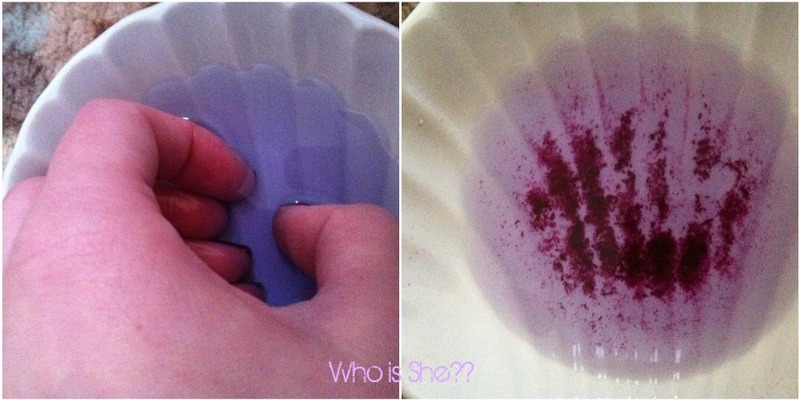 So to soak the gels off, all what you need to do is fill a small bowl with the Get Em’ off- enough to cover your nails and wait for 15 minutes. Throughout I was keep removing my nails to see if the gel was melting, as well as scraping bits off. As you can see they’re just about soaked off, a little bit of scraping with my nails and they’re were off. I think the flash on my phone has made it look a little bit extreme. After a quick wash, these are what my nails look like. The nail surface does look rough from the prep on my nails, however after a quick buff they looked fine. My thumb nail actually looks way worse than it is. Next step was treating the nails- I didn’t want to apply polish straightaway on my nails so I went a little bit over the top with my handfood and left the air get to my nails for a good 6-8 hours. 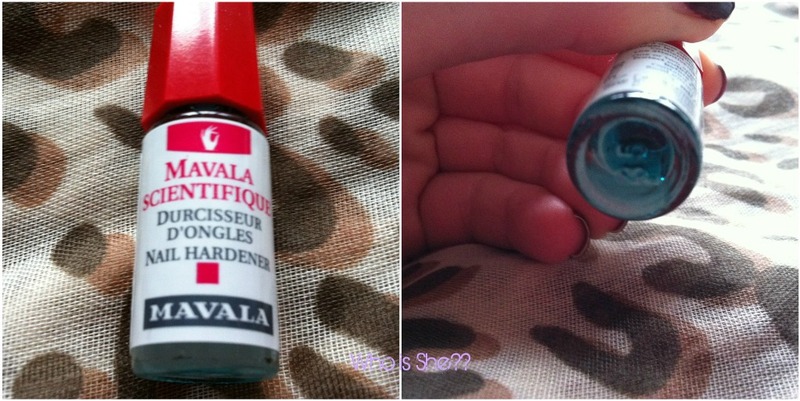 Then onto applying the Scientifique- it states on the bottle that you shouldn’t let this touch your cuticles and only paint on the top half of your nails, I’m also warning you it stings like a pain in the backside if you get it on a cut. Mavada recommend that you use this product twice a week for a month, and then afterwards only once a month. I paint this on my nails (Wednesday and Sundays) and allow it to dry then I’ve just been painting my nails clear or OPI Passion. Its worth noting that I do have some staining of the nail especially on my left hand from a St Tropez mishap, and there is some bits of the gel nails left on the sides of my nails, which I haven’t removed properly. However in the 3ish weeks since I’ve embarked on this treatment my nails haven’t been stronger- no splitting nothing- the opposite of what you would expect after having any type of nail extensions. Roll on next week until I get them put back on. If you have any questions let me know in the comment box below and I’ll get back to you asap.